Today our country lost a true trailblazer: a woman and Girl Scout alumna who, through her hard work, tenacity, and dynamism, rose to become one of the most powerful and respected women in America. Janet Reno, who served as the first-ever female attorney general under former President Bill Clinton, and who was a proud, lifelong member of the Girl Scout Movement, died today at the age of 78, after battling Parkinson’s disease for several years. Born and raised in Florida, Reno worked as an attorney in Miami before joining the staff of the Judiciary Committee of the Florida House of Representatives in 1971. Her distinguished career in public service took her from the Florida State House to a long career as a Florida state attorney, a position to which she was reelected by Florida voters four consecutive times. 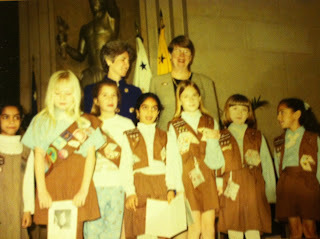 In 1993, the same year she addressed the National Council Session of Girl Scouts, Reno was appointed as the nation’s first female attorney general by President Clinton, making her head of the sprawling U.S. Department of Justice and one of the most powerful and important people in the Clinton administration. Throughout her tenure as attorney general and her illustrious career, Janet Reno conducted herself to the highest standards of the Girl Scout Promise and Law, and lived a life reflective of the Girl Scout mission. The entire Girl Scout Movement mourns the passing of this pioneering woman, whose courage, confidence, and character made the world a better place.